Choose Size SM / Rider Height: 5'4" - 5'7" MD / Rider Height: 5'7" - 5'10" LG / Rider Height: 5'10"-6'1" XL / Rider Height: 6'1" - 6'4"
EXCEPT for just one minor thing. Shifting is crisp but you must be gentle and pedal easy while shifting. It likes to be shifty in the middle of the gear range, it’s not much of a problem, but you gotta be gentle with pedaling until you’re in the 1st or 8th gears..
Stop reading and go buy one. Just unboxed and couldn’t be happier with my purchase. Great quality with sturdy parts and unbeatable build. Rides beautifully on the extra wide tires with more than makes up for any sort of suspension. This bike is extremely light and stealthy to say the least. Also has great finishings and all around can’t be beat for the price. If you have any doubts, don’t. You won’t be disappointed. Fun bike. Everyone should own one. I have all sorts of bikes.... classic beach cruisers, BMX Bike s from 20" to 29", single speeds, fixied gears, road bikes, flat bar road bikes, cross country, downhill and dirt jumpers. I thought I had all my bases covered until I saw this. This bike is pure fun. Pedals easy, only 8 speeds in the rear so no fussing with a front derailleur, plus size tires to absorb impacts and keep the ride comfortable and just leaves me with a big smile on my face. Since getting this my road bike and flat bar road bike have been collecting dust because this is all I ride when I am not on dirt. Honestly I initially thought this was just a marketing gimmick to get people to buy another niche bike. I thought "It's just a mountain bike with slicks" Glad curiosity got the best of me and I bought one. 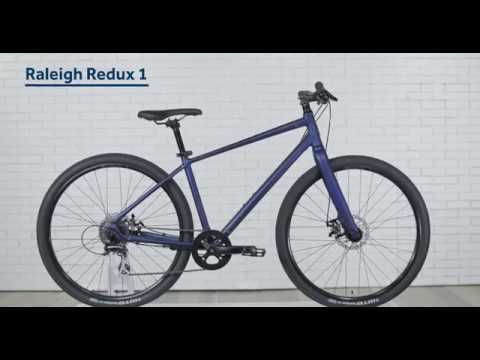 So much better than a mountain bike with slicks and the plus size slick tires roll so smooth but still give you cushioning and even absorb shock if you decided to jump something. It took me about 45min to assemble this bike including watching the video online. I test ride it twice and made some minor adjustments. It rides super smooth. It has today's tech ( disc brakes, cables in frame and wide smooth tires. I've put about 50 city miles on it and it works perfectly. Who knew all you really need are 8 gears but as a minimalist that is truly all you need. I love this bike and wouldn't hesitate to recommend it to a family member or friend.